Quartz Quadrant always features a mixture of both internal and external visual backdrops. In the Present, you begin inside the rocky quartz mines whose background consists of purple stalactites and stalagmites on the floors and ceilings and lots of other little purple rocks in the middle, with a few glowing quartz crystals, all amongst a black background. Not that interesting, until you step outside into a nice forest area. Here, pointed, slightly abstract trees form the thick forest below a pleasant blue sky filled with small clouds. Underneath the forest are lots of pointed and even more abstract brown rocks, some cigar-shaped and pointing upwards with a spiral pattern, and lush blue waterfalls drop down in gaps between them. Reminds me of a sunny Sunday afternoon, for some reason. 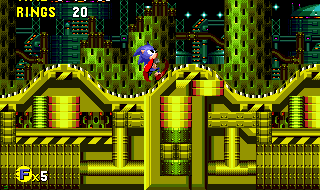 In the foreground, Eggman has placed man-made structures on presumably natural rock, which features green and turquoise patterns of a series of upside down triangle-like shapes, with the usual various intrusions and extrusions. Ground containing twisting tunnels relies more on a green mesh-based appearance and some mechanical things such as pipes and other assorted doo-hickeys are embedded all around the place. Surfaces of the paths are either wooden structures or long mechanical conveyor belts presumably intended to carry around the contents of the mines. Green quarts crystals can be found in various formations along the path including vertical chunks, large slanted crystals or even ones that look like Christmas trees. Large ones that glow from blue to purple line the very top and bottom of the level even further into the foreground. Even though the cavern is internal itself, you can get even more internal with the backgrounds of some large areas covered by a wall of tiny dark red circles, also with various vertical extrusions, and more machinery and metal pillars are peppered around it. This wall can appear shorter in other areas, reaching only a little way off the ground in uneven chunks. In the Past, the caves are much more detailed. Bright green ooze is the order of the day here, as there are large pools of it across this spacious cavern, reaching all the way to the bottom of the level. Crystals emerge out of it while pointed rocky stalagmites reach up in a long line further into the background, with more ooze behind them. Stalactites as far as the eye can see hang from the ceiling, with a far background of pure black. The outside goes a bit more pre-historic with stumpy purple mountains in the distance and a pale purple sky with a few clouds. The forest is further away than in the Present and consists of lots of light coloured trees and a few tall leafless ones. In front of this is a large pale lake with lots of rather dead tree bark sticking out of it, and there's a bit more forestry at the bottom. The patterned ground is now green with lots of wood or brown cave rock around, laid out in various interesting patterns and visual structures. The internal walls that cover large areas are a green checkered pattern this time, made up of tiny squares and lots of intrusions and extrusions. With wooden logs, small parts of this wall reach up vertically from the ground in other areas, also with green diamond shapes on the uneven tops, and moss hangs from occasional ceilings. Various leafy vines curl around each other from floor to ceiling within narrow corridors, wrapping themselves in a strip around the wooden floor. At the beginning of Zone 1, they're also found with collections of odd, half-cut hollow green cylinders. The foreground is very decorated in general here. The caves of the Good Future are completely different, and don't even resemble caves anymore. It's more like a futuristic city shrouded in complete darkness apart from multi-coloured lighting, illuminating a wide range of structures and buildings, and the floor and ceiling still contain the usual large quartz crystals, now static purple. Head outside and on the bottom of the background you'll find a large turquoise wall of machinery, organised mostly into tall pillars and domes, complete with purple lights in places. Above this are green bushes and plant-life amongst more metal domes and tall, mop-headed palm trees, and behind that, rocky purple mountains below a pale blue sky. For the foreground, the triangular patterns occur less frequently in light blue patches, but most of it is based on solid yellow blocks and panels with various other patterns and technical things, of course. 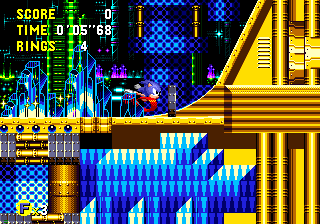 The internal walls are made up of dark blue columns, featuring a pattern of small squares linked to each other by diagonal lines, and as usual, this also reaches up a little way off the ground in other areas. Thin yellow piping is present now and then, either popping out of the ground or creating a small network between floor and ceilings. Clear crystals with light blue outlines also offer up some additional decoration along the paths. 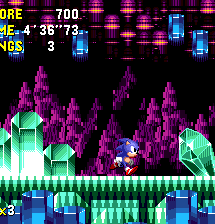 The caverns have been completely taken over by Eggman's machinery in the Bad Future, with all the crystals presumably having been extracted. Tall dark green towers and other deadly structures, all lit in various colours sit on the other side of what appears to be a floor of molten rock and magma. Rather frightening machinery hangs from the ceiling, with purple lights and bending pipes. Outside is a depressing scene. It's nothing but miles of dreary brown factories and lights, and the sky is ablaze, glowing from red to purple, and fiery yellow along the horizon. The foreground is designed much like the Good Future's, with large blocks of colour and panels rather than patterns, and this time the colour is a most unexciting olive green, and there are pipes, technical gubbins and yellow and black danger strips. 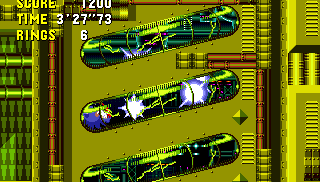 Internal background walls are made up of curved pillars and vertical sections, all with holes indented into the dark green metallic surface, and small pipes create networks within corridors. Quartz Quadrant, though consisting of rather horizontally long maps compared to the other levels, is quite quick and easy, and shouldn't provide much in the way of a challenge as far as the structure is concerned. It's like Palmtree Panic in that it moves at a pretty choppy pace, with long roads that carry on straight from left to right, with little turning back forced upon you. Multiple routes (usually three, but as many as four) are stacked up on top of each other in these linear directions, but they tend to be quite heavily broken up by gaps and platforms, as well as huge rooms that they all connect into, so it's quite hard to actually stay on one horizontal plane. Aside from the large open rooms, usually with an internal wall as their sole background and springs dotted around, areas are usually pretty enclosed, with low ceilings from the route directly above. Moving conveyor belts occupy a good half of all of the surfaces of the pathways, and these feature a variety of slopes, curves and steps to deal with. 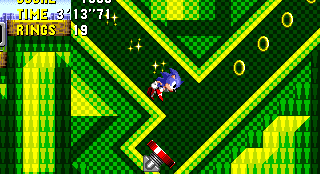 It's not uncommon to have several sloping bumps in succession, plus much larger, taller slopes and then even very long stretches of perfectly straight ground, mostly on the far bottom floor of the stage, and usually containing several enemies and objects along the way. 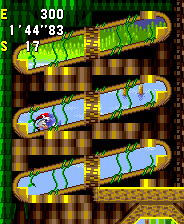 Particularly in Zone 2, some paths consist only of a series of small platforms in the air that are actually part of the structure rather than objects, and twisting tunnels and other forms of tube-based transportation are also common. Small but frequent structural changes tend to occur between the time zones, such as different shaped paths or tunnels, and while it's sometimes difficult to backtrack beyond a certain point, particularly where the large internal rooms are concerned, there's usually a way to do it, with a little skill. 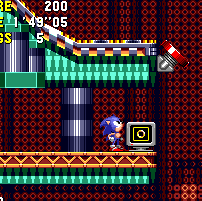 No doubt the key feature of this level is the conveyor belts. They appear all over the place, across many of the paths and often travel over bumps and small slopes in the road, and can even appear on platforms. Like any conveyor belt worth its salt, it'll carry you along in one direction if you stand still, and you'll be a little faster when running toward that direction on it, but a little slower when running against it, and conveyor belts in the Futures appear to move at a slightly quicker pace. Nearby most significant patches of belts is a switch that will conveniently change the direction when you touch it. All the conveyor belts seem to travel in the same direction at the same time, and touching any switch will reverse this for all of them. It features an arrow pointing in the appropriate direction, and for each time zone, the directions are colour coded, both in the colour of the arrow and the colour of the thin conveyor belts themselves. In the Present, it's pale purple for right and yellow for left, and the Past has grey for right and red/orange for left. Both the Futures have purple as their left colour, but the Good Future has green for right, while the Bad Future uses white. Another conveyor belt formation very useful for time travelling is in thin vertical drops in the ground. 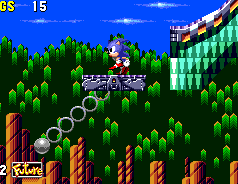 The belts run along either walls of this and when the direction is set to right, you'll be forced down the drop, but when heading left, you'll be forced upwards, and you can remain directly above it in the air and fall back down to maintain a safe time travelling momentum. There are switches on either end to change it. They're quite big on platforms over here in Quartz Quadrant too. Standard ones come in small, medium and large flavours regarding their length, and some can be found stationary, dropping only a little bit under your weight. Others move left/right or up/down across a certain distance and may have springs across their top surface, and some will begin to fall when you stand on them. Rarer ones will do the reverse and actually begin travelling upward, stopping at a particular place to deliver you to another ledge above. Don't worry, these won't crush you into the ceiling, no matter how close to it they get. As I mentioned in the above paragraph, also be careful of some of these platforms adorning a tricky conveyor belt along their top, whose direction can be altered by any switch, and these are also present on 180 or 360 degree swinging pendulum platforms. The trick is not to hold the opposing directional button but just press it at regular intervals, once you've got a firm footing in the middle. 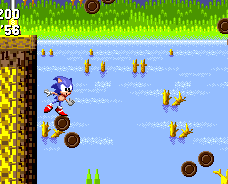 Found in only one or two instances, you can also get four pairs of small circle platforms (the kind you would typically find composing log bridges linking two ledges, which incidentally, are also found in this level). In their pairs, these all orbit around one invisible point, next to a high ledge on the left and a low one on the right, and remaining on them is tricky, but with care, they can be used to travel horizontally and vertically between the ledges. Try and stay on whichever circle is the highest of the pair, and in the Futures, these circles have a straight surface at the top, and move much quicker. There may be a pit of spikes to watch out for nearby too. Watch out for small hanging blocks of rock above the paths that are ready to drop and smash when you stroll underneath, and this danger also comes from small stalactites that simply fall right through the floor. Thin crumbling paths linking two ledges are a standard trap, and when you come to a thin wall in the corridor blocking your way, a simple jump into it will see it fall. There are glass transportation tubes that wind around in a coil in one part of the foreground, with anything from two to six coils in one go. 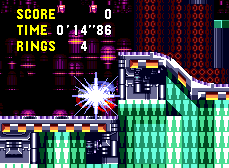 You enter through a hole in the top that's usually invisible, and are rocketed out of the right side at the bottom. Although they can get your time travelling momentum going, most don't last long enough to see it through, so afterwards, you'd be taking your chances outside of it as you try and keep your top speed. Twisting, turning tunnels in the ground, ala Palmtree Panic, present a similar affair. In the Good and Bad Futures, there are groups of two or three strange, bouncing platforms along the bottom of the zones. In a horizontal line, they appear in unison out of the ground, rise up quite high and then go down through it again, while heading left. When the platform in front goes too far left it disappears and a new one appears at the starting point on the far right side, and they move continuously in this fashion. Fortunately, they cannot crush you into the floor. Four ground-based enemies to dismantle in this level. Pink worm bots who resemble Caterkillers from Sonic 1 slowly wriggle their way back and forth across an area. The healthy ones have harmful spikes across their body, so they can only be attacked on the head, but the older varieties lack spikes, so they can be assaulted anywhere. Blue and yellow scorpion robots move across the ground, pausing to fire small projectiles in your general direction from their laser gun tails. The noticeably more dilapidated ones move more slowly and their gun is long gone. Blue spider robots are incapable of moving on a horizontal axis, but the new ones can jump pretty high. They turn to face away from you so that they can fire a tangling of sticky webbing at you which, funnily enough, also prevents you from moving either left or right until it disappears after a couple of seconds. 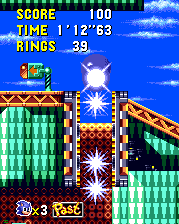 You can still jump during this time however and you won't lose any rings from it directly - just time. The older models lack this ability and can't jump as high either. Finally, unusual yellow and pink snail robots trundle along rather slowly across an area, and should you intrude on their personal space, they'll stick out three spikes from their back, which only slot back down once you exit the premises. The older variety don't move any slower but they do lack the ability to defend themselves with these spikes. Quartz Quadrant features blue-stemmed flowers with yellow petals and light red stigma. In the Past, take the bottom route, after the first large internal room for this extra life. Tiny, singular platforms with conveyor belts on them are rare but as you can imagine, rather difficult to maintain much purchase on. A common structure involves dipping in and out of diagonal tunnels, with mounted springs to help ease you through. Another life can be found on the zone floor towards the end, in the Futures, just before the second internal room. It's guarded by two spiders. Please note: If you are playing the new 2011 version of the game (XBox 360, PS3, iPhone, iPad, etc) most of the time travelling advice provided in this level will no longer work. For some reason, tricks using either vertical or horizontal conveyor belts no longer maintain your warp speed. I will update the guide to address some new solutions in full when I can, but for now best advice is to try to find a long stretch of unbroken ground (there's plenty on the bottom route) to run across. Check for any obstacles that you'll need to jump over first so that you can adequately prepare yourself. Time travelling is quite easy in the Present, and the simplest method relies on narrow vertical passages with conveyor belts running along the walls. 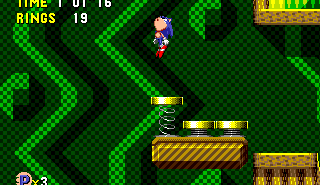 When these are set to run left using the nearby switch, Sonic will continually be thrown up through the passage and allowed to simply fall back down it when he reaches the top, without you having to move him at all, and he is only thrusted upwards when he hits the bottom of the passage. Use this mechanism to maintain a fool-proof time warp for as long as you need. The first instance of this vertical conveyor belt can be found not far from the start. As you begin the zone, rather than touching the nearby spring, proceed right but don't go down the steep slope, although it might be an idea to touch the Future post even if you don't want it, to prevent it from being active should you fall and have to return here. 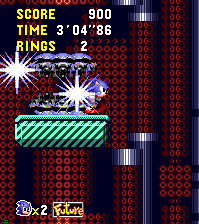 Instead, head upwards using the two moving platforms. 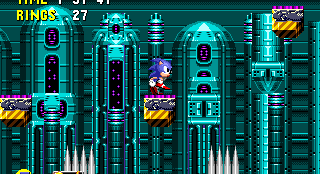 Jump off at the top ledge and proceed across the collapsing floor and regular conveyor belt, at the end of which is the vertical one you seek. A Past signpost can be found just to the right of this, but be careful not to fall off the edge. If you do take a tumble there then it's possible to backtrack to this point by performing a spin dash or peel-out up that steep slope at the beginning of the zone, but once you get to the first large internal room (with the patterned background, rather than views of the caves or outside), backtracking becomes a bit difficult. Take my advice in Point #1 to try and get back to the first vertical conveyor belt, grab another Past post from the upper routes, or instead, you can use it to get to the second vertical conveyor belt. Described in Point #1, use that upper horizontal spring (not the lower one) to catapult yourself across to the other side of the large room. Proceed right from here, leaping over the gap in the road and you'll soon find the belt leading downwards, into a little hidden room containing a shield. Make sure you've activated a Past signpost already though, because there isn't another nearby. 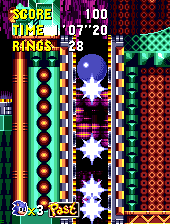 The third and final vertical conveyor belt of the zone can be found not far right of the second. It's also accessible by taking the lowest route, along the floor of the zone. 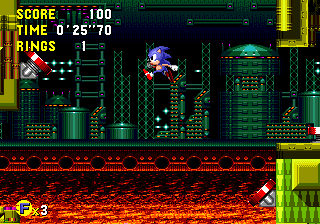 Just keep heading right until you find a vertical red spring sitting by itself on the floor, and this will propel you up onto a small platform with a switch, below the vertical conveyor belt in question. One slight concern with this route is that next to the small orbiting circular platforms, around the middle of the zone on the bottom floor, is a Future post in a narrow corridor that may be difficult to jump over, if you want to keep your Past one. Another danger is losing it as a result of running fast along the many straight paths around the place, but failing to complete the warp. Though it is perfectly possible to warp just by running along a straight path, I wouldn't recommend it if you don't know exactly what's coming. The Past throws a bit of a wrench into the works because the vertical conveyor belts apparently haven't been invented yet. Ah. 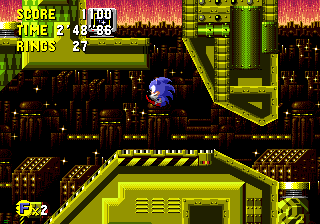 You can find a long, straight piece of ground to run across, but an easier method also makes somewhat sneaky use of horizontal conveyor belts, in particular, ones that lead straight into a wall or step. 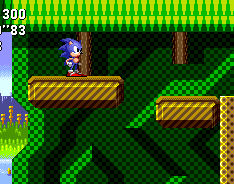 You see, if you change the direction of the belt to head towards the wall and then build up some speed as you run into it, when you hit the wall, Sonic won't stop and start pushing up against it as he normally would. When he's running on the conveyor belt, he'll keep running even up against the wall, and this will allow you to warp safely. 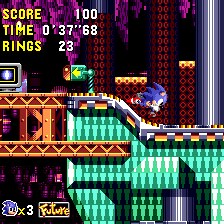 There's one of these belt/wall combinations right next to where the first vertical conveyor belt was in the Present, on the highest route near the start. There's another shortly after the part where small circular platforms are orbiting around an invisible point. From there, simply drop to the bottom floor and head right along the conveyor belt underneath. 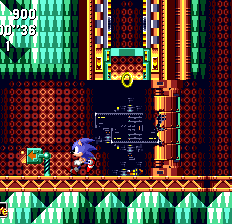 When you reach a second conveyor belt along the bottom floor, you'll notice this goes into a wall on the left. 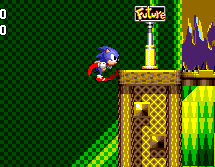 Future posts are pretty easy to find, but the actual conveyor belt switches that you may need to use to change the direction are a little more scarce than normal, so you might have to hunt around for a bit. In the Good and Bad Futures, you should find things are back to normal, and the same vertical conveyor belts are available as in the Present, although the surrounding level structure is often quite a bit different. If you find your way to the uppermost regions, at the very end of the zone, there are two different high speed tubing systems in the ground that lead downwards, coiling six times each, and this is enough to send you on a warp as well, though you may be dangerously close to crossing the end of the zone anyway, so it might not be worth it. In the Present, once you approach the first large, internal room not far from the start, and fall to the bottom, it can become quite tricky to get on the upper-most routes of the zone, or to backtrack to an earlier point. If you wish to do this, head to the far left and you'll see a red diagonal spring near the floor that's not much good for anything. Jump past it, watch out for the spikes, and get up to the ledge above it. On the far right side of this ledge, you'll see another diagonal spring above you that's quite awkward to jump to, but this is the one you need to try and hit from there, to propel yourself upwards. 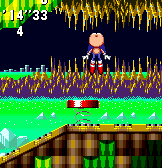 This should throw you towards a higher area on the far right of the room, though you might land in some spikes. From there, either head right, or use a moving platform with a couple of springs on it in the room to backtrack via an upper left-hand route, or head up to the highest route on the right. Not too difficult, in the Past, the machine can be found hanging around the top of the first large, internal room. 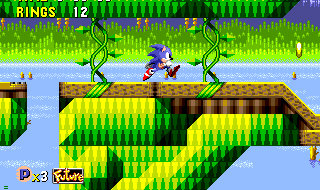 The first of two large areas with a background of small green checkered squares. It doesn't matter what route you take to get there, or from which direction, as it's fairly easy to ascend from the ground. 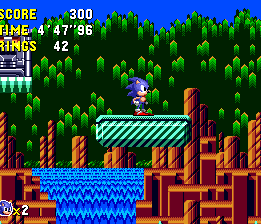 Hit the diagonal spring on the bottom right corner, and hold right as you're thrown across to land on another diagonal spring higher up on the left wall. A couple of moving platforms with yellow vertical springs on top will bounce you up to the machine, which is sitting, unguarded on two long stationary platforms. Unfortunately, there are no straight vertical conveyor belt systems at all in this zone, so time travelling becomes much harder. The most obvious method (though not the earliest in the level) for guaranteed successful time travel when in the Present or Past is found in a one-off winding conveyor belt system that leads up and throws you out toward the machine, via a short curving tunnel at the top. This is in the second large internal room, at the floor entrance to it from the left, which is the only entrance into the room, so you can't really miss it. 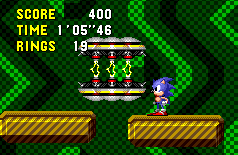 It occurs about two thirds of the way through the zone, and you'll notice some rings leading up into the belt on the ceiling, with a switch nearby, and a breakable wall to the right. Activate your chosen time travelling direction (In the Present, Past posts are most common around the first large internal room and the routes surrounding it, so you might have to backtrack a bit), and flip the switch to the left. Jump in to the conveyor belt on the ceiling, and don't touch a single button as you're blasted out into the room at the top. You'll go past the machine and should warp in the air. 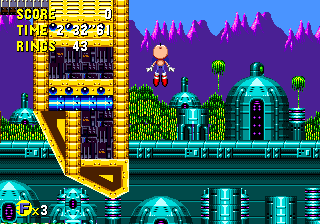 Even if you're playing the original Mega CD version, which requires 5 seconds for a time warp, you should just about make it before touching the ground, providing you don't press any buttons while doing so, and let Sonic run in auto-pilot. 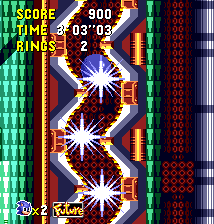 Unfortunately, when attempting to use this mechanism in the Good or Bad Future when playing the Mega CD version, the time travel won't work because there's no platform to run across that supports the machine, and you'll hit the floor before the 5 seconds are up, but it is possible on the PC/Gems version, which requires only 3 seconds. 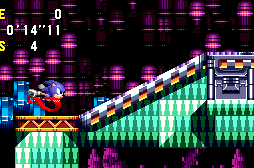 As I described in Time Travelling Tips for Zone 1, there are still places where horizontal conveyor belts can lead into a wall, and if you run full speed at that wall, along the conveyor belt when it's facing that direction, you'll be able to maintain your speed while running against it for as long as you need. The first instance of this is near the start and is available in all time zones. From where Zone 2 begins, you'll find a Past post as you carry on along this first path. Drop down the small gap immediately to the left of the post and you'll find the wall that you can run towards on the right. 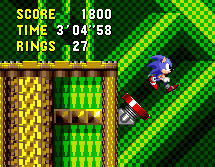 To get enough speed, go over to the stable ground on the left, or stand still on the conveyor belt as it carries you (which you'll need to do in the Past, as a spring embedded in the belt will get in your way), and charge up a peel-out or spin dash, and if you need to change the direction of the belt, there's a switch all the way to the furthest left corner on the highest route. The second instance of this belt/wall combination is only available when in the Present, and located on the middle route leaving the right-hand wall of the first large room, and there's a checkpoint and Past Post next to it. 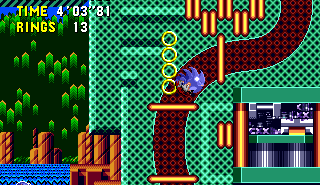 In all timezones, PC/Sonic Gems Collection players can also utilise the long conveyor pathway leading into the winding tunnel described in Point #2, high up near the end of the zone. You should warp just in time as you come flying out of it. If all else fails, you can always try and get lucky by preparing a long, straight path to run across, and there's plenty of opportunity for this along the bottom routes of the zone, but I'd always recommend something more secure, if possible. The machine is near the top of the second large internal room this time, and I've explained how to get to it in the first paragraph of Time Travelling Tips. It's on a platform high in the air and is accessible via the winding conveyor belt path on the left wall of the room, or one of the springs on the right side, and it is unguarded by badniks. 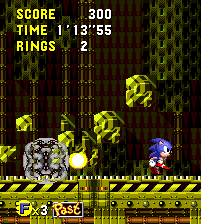 In the first large room where you found the machine, on the right wall, take the third route up from the bottom/second down from the top, which is next to the moving platforms with yellow springs on them. This is the same route that leads to the second vertical conveyor belt bit in the Present and Futures. 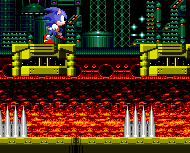 Proceed along it, hopping the gap, and after a pair of internal diagonal passages with a spring between them, you will find the dastardly Metal Sonic hologram, on a lower ledge. Metal Sonic is right back at the starting point of this zone, which is the upper middle path all the way back on the far left side of the map. To get there easily I guess you could die on purpose, if you have enough lives to spare in order to complete an entirely optional task whose reward is seeing only a few happy animals, that is. 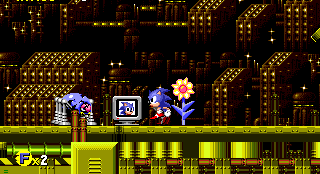 Sonic in the present timeline of Quartz Quadrant. 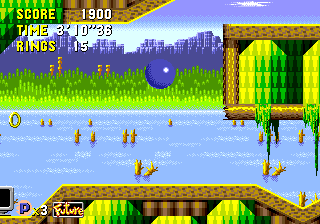 Quartz Quadrant is the fourth round in Sonic the Hedgehog CD. 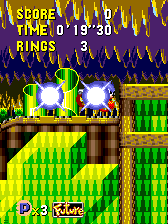 The boss of the third Zone is Dr. Robotnik in a conveyor belttrap room. Quartz Quadrant is an aqua-colored mine bustling with machinery, and is in the process of extracting crystals (most likely quartz hence the round's name) on conveyor belts and platforms for an unknown purpose. Some of the quartz is being transported while some are left lying around. The outdoor area features a swamp where the quartz are being shipped off to whatever distant land they are designated to. In the past, it is a green, peaceful cavern where a very large quantity of crystals remain in a type of ooze. Outside these caverns, a swamp/bayou is present showing dead driftwood in the waters and forestry at the bottom of the zone. 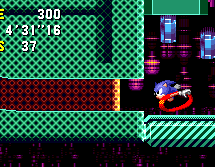 Conveyor belts are present, but are not being used for any purpose just yet. 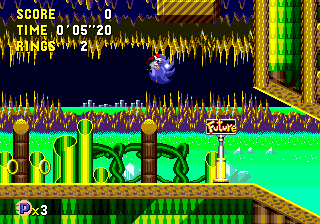 In the Bad Future, it is an over-mechanized olive green rusted mine under Dr. Robotnik's influence where absolutely all of the quartz has been mined out. A river of what appears to be lava (but could possibly be melted quartz) runs through the bottom of the zone, and a factory-like dystopia stretches for miles under a fiery sky. The factories may or may not be attempting to create artificial quartz, but it seems that their operations might have backfired in some way. In the Good Future, it is an underground, golden-colored utopia that is seemingly hidden from society. All of the mining has ceased by this point and opulent towers of quartz gleam through the darkness. Outside of this wonderland of quartz, there are futuristic domes with mountains and forestry beyond them. A wall is seen at the mid-height section of the zone featuring the same type of domes; it may be there to keep unwanted outsiders away from the underground city. There are no active mines or swamps here in the good future, but more quartz are found here than in any of the timezones. 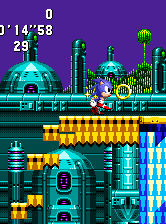 Sonic CD has a time travel theme and fittingly, quartz is used in many modern analog watches. In fact, analog clock faces are commonly used to show passage of time (this was present in the opening of Sonic Generations). 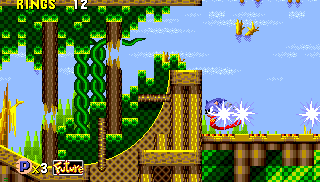 The music used for the American version of Quartz Quadrant (Good Future) was remixed for N'rrgal Colony in Sonic Chronicles: The Dark Brotherhood. *Scrapped information about Sonic the Hedgehog CD. 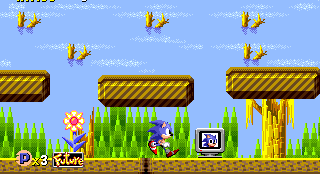 ^Wasn't mentioned in the Sega Mega-CD release of the game.